NI FINANCE Minister Simon Hamilton MLA travelled to Copenhagen today to meet key officials to progress his reform agenda. The visit involves a series of meetings, including meeting Niels Godtfredson, Director of the Agency for the Modernisation of Public Administration, Kit Lykketoft, Deputy Director of Mind Lab, (which is a cross governmental body set up to identify innovative solutions to public service delivery) and Lars Frelle –Petersen, Director with the Agency for Digitisation. 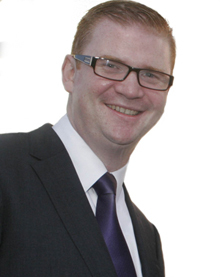 Finance Minister Simon Hamilton MLA. Commenting after his meetings, Simon Hamilton said: “One of my top priorities as Finance Minister is to build a more innovative, efficient and effective public sector throughout Northern Ireland. “I have come to Denmark to examine best practice and explore how the Danish Agency for Public Administration Modernisation identifies and evaluates its innovation and efficiency measures. I wish to determine what key reforms have worked and what have not. I want to fully maximise this sharing of knowledge and best practice and use it to the best advantage for everyone in Northern Ireland. Both visits have confirmed for the Minister that public sector services in Northern Ireland would benefit from similar practices from what he witnessed in Denmark.